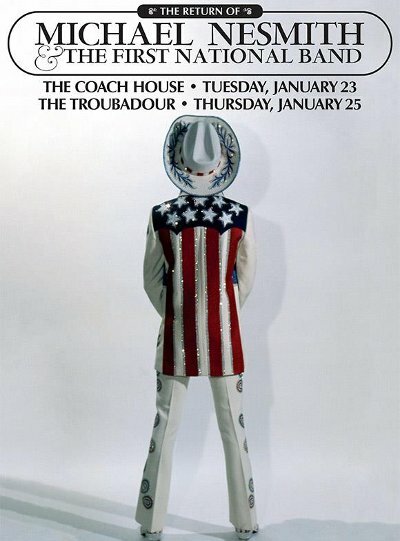 Michael Nesmith brought back and important part of country rock history Sunday (January 21) night at Pappy and Harriet's in Pioneertown, CA, with a show of music recorded with his First National Band. 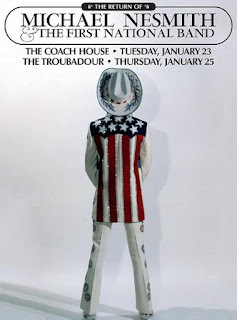 Sixteen of the 22 songs in the show were from Nesmith's three albums with the First National Band, Magnetic South (1970), Loose Salute (1970) and Nevada Fighter (1971). Opening the show with the title track from Nevada Fighter, Nesmith quickly moved into a track-for-track performance of Side A of Magnetic South including his biggest solo hit, "Joanne". Peppered throughout the night were a few songs from later projects including three from his fifth solo set, ...and the Hits Just Keep on Comin' (1972) and one from the followup, Pretty Much Your Standard Ranch Stash (1973) along with his late-70's hit and pioneering video "Rio" and the Monkees era album track "Papa Gene's Blues".